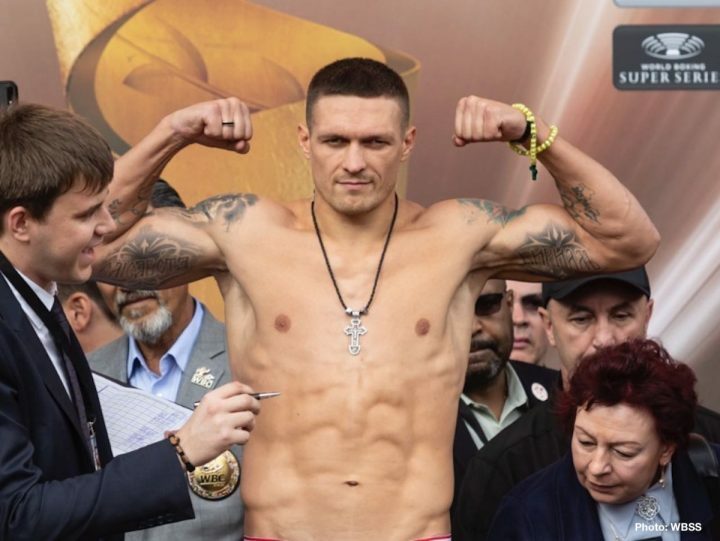 By Scott Gilfoid: Tony Bellew fans got some bad news on Wednesday with the World Boxing Association ordering WBA ‘Super World’ cruiserweight champion Oleksandr Usyk to face WBA ‘Champion in recess” belt holder Denis Lebedev. The negotiations deadline is October 3 or 4, according to rssport.ria.ru. Lebedev wants his chance to recapture his title that he previously held. However, Usyk is in negotiations for a title defense against WBC Champion in Recess Bellew in a fight that is being slotted to take place on November 10 in the UK. I’m not sure that Bellew would beat some of the other top contenders in the division like Ruslan Fayfer, Kevin Lerena, Andrzej Fonfara, Andrew Tabiti, Mike Perez and Dmitry Kudryashov. Those guys would be very tough outs for Bellew. It doesn’t matter though. Bellew is getting the fight with Usyk due to his popularity in his home country in the UK rather than what he rates. It’s likely that Usyk’s management will try and work a deal with the WBA and Lebedev in order for the Usyk-Bellew fight to go ahead for November 10. Perhaps a step aside fee can be made to Lebedev for him to stay out of the way for the Usyk vs. Bellew fight to take place. Usyk needs to make up his mind whether he wants to keep his WBA title bad enough for him to hold off on the more lucrative fight against Usyk. It won’t be a big deal if Usyk vacates the WBA title, because he would still hold the IBF, WBC and WBO cruiserweight titles, and he’d still be viewed as the best fighter in the division by the boxing public. If Usyk is hung up mentally on keeping all four titles and if Bellew insists on the WBA belt being up for grabs when they fight, then it leaves him with no other choice but to face the 39-year-old Lebedev (30-2, 22 KOs) next to follow the WBA’s orders. Lebedev hasn’t fought since beating Mark Flanagan by a 12 round unanimous decision 14 months ago in July 2017. Before that, Lebedev was beaten by Murat Gassiev by a 12 round split decision in December 2016. At the time of that fight, Lebedev was the IBF/WBA cruiserweight champion. What’s interesting is the WBA allowed Lebedev not to have his WBA title on the line for that fight. So when Lebedev lost to Gassiev, he was still able to keep his WBA belt while losing his IBF strap. It was a very odd move on the WBA’s part not to have their title on the line for the Lebedev-Gassiev fight, and even stranger decision not to strip Denis of his WBA belt after he was beaten soundly. Lebedev is scheduled to face Hizni Altukaya (30-2, 17 KOs) on September 7 at the Traktor Sport Palace in Chelyabinsk, Russia. Following that fight, Lebedev is scheduled to fight on October 27. That presumably would be win Lebedev and Usyk would wind up facing each other. The WBA’s decision to order the Usyk-Lebedev fight impacts the 35-year-old Bellew’s dream of facing Usyk for his four cruiserweight titles in November. Unless the WBA changes their mind about wanting Usyk to face Lebedev next, it means that Bellew is going to need to sit on the sidelines and wait until that fight takes place before he gets a shot at fighting Usyk. In other words, we’re probably looking at Bellew needing to wait until 2019 before he can get a fight against Usyk. I don’t think it matters much to Bellew that he has to wait a little longer for his golden parachute fight against Usyk, because he’s supposedly retiring anyway. Bellew (30-2-1, 20 KOs) had to wait an entire year waiting for David Haye to finish licking his wounds before facing him in a rematch on May 5 last year. Bellew probably won’t have any problems waiting another 8 to 10 months before he faces Usyk. The one that is really hurt in all of this is Usyk, because he wants to move up to heavyweight to go after world champions Anthony Joshua and Deontay Wilder. By having to burn through a fight against Lebedev before facing Bellew, it essentially means that Usyk is going to lose a year of his career before he eventually moves up to heavyweight. If Usyk sticks around the cruiserweight division long enough to face Lebedev and Bellew, he’ll be a year older before he finally officially moves up to heavyweight to begin pursuing a title shot against IBF/WBA/WBO champion Anthony Joshua and WBC champion Deontay Wilder. It’s easy thing for me to figure out what Usyk needs to do to clear up this mess. He obviously needs to throw the WBA title in the nearest bin and go after the money fight against Bellew so that he can make his move up to heavyweight afterwards. There’s no point at all in Usyk keeping all four of his cruiserweight titles and taking a pointless fight against Lebedev. It’s academic that the ring rusty Lebedev has absolutely no chance of beating Usyk. I mean, Lebedev lost to Usyk victim Gassiev in 2016, and that fight is all you need to look at when you factor in what kind of chances the 40-ish former WBA champion would have. It’s not worth it for Usyk to hang around the cruiserweight division trying to satisfy the requirements of the different sanctioning bodies in order for him to one of hi straps. If the southpaw Lebedev was five or six years younger, he might have a shot at beating Usyk, but definitely not now. Lebedev is too old, too ring rusty and too battle worn for him to have much of any chance of defeating a talent like Usyk. It’s a horrible fight in 2018, but a good one if it had taken place in 2012 or 2013. It’s too bad Lebedev and Usyk didn’t fight each other way back then rather than looking at facing each other now. Lebedev will be an easy fight for Usyk if it happens. I’d be very surprised if the two of them do face each other, because like I said, some kind of deal will likely be worked out so that Usyk can face Bellew in the money fight. I don’t think it’s worthwhile for Usyk to hang around the cruiserweight division after he faces Bellew. The money for Usyk is at heavyweight, not at cruiserweight. The only money fight for Usyk at cruiserweight is Bellew, which is entirely why he called him out after beating Gassiev in the World Boxing Super Series tournament final last July in Moscow, Russia.